2 inch elastic tape. Elastikin is are preferred brand for ease of use although there are cheaper brands. 3 inch elastic tape. Elastikin is are preferred brand for ease of use although there are cheaper brands. 4 inch elastic tape. Elastikin is are preferred brand for ease of use although there are cheaper brands. 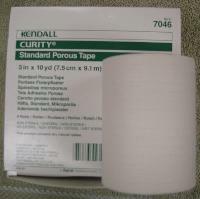 1 inch porous white adhesive tape. Non elastic so this tape should be spiraled down limbs in barber poll fashion so if the limb swells it does not constrict circulation. 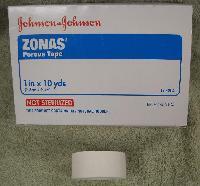 2 inch porous white adhesive tape. Non elastic so this tape should be spiraled down limbs in barber poll fashion so if the limb swells it does not constrict circulation. 3 inch porous white adhesive tape. Non elastic so this tape should be spiraled down limbs in barber poll fashion so if the limb swells it does not constrict circulation. An elastic bandage that is strong and provides support. Applies pressure to inhibit bleeding. Is flexible enough that when used properly with padding it will not cut off circulation. Adheres to itself so no clips or fasteners are needed.